Davido was among the 2152 Batch "B", Stream 2 corps members sworn-in yesterday at the Lagos State NYSC Orientation Camp, Ipaja. 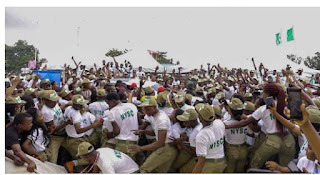 The singer was smuggled through the crowd into an office for safety as security personnel had a hard time controlling fellow corps members and NYSC staff rushing to catch a glimpse of him. In a brief chat with newsmen, the DMW boss expressed gladness to be able to partake in the scheme. "I am a youth and I am delighted to serve my fatherland. 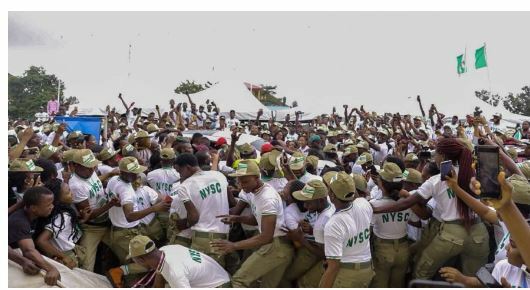 "NYSC is also a leadership development programme and since I will not remain a youth forever, I have to start preparing myself for the future," - he said.